Twenty-one hilarious chapter books in one great box! 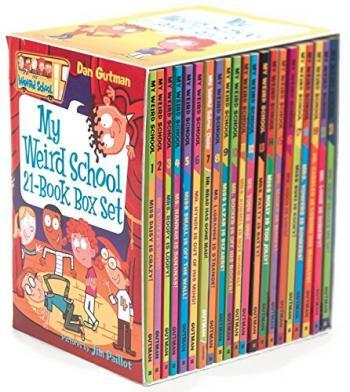 With more than 12 million books sold, bestselling author Dan Gutman's My Weird School series really gets kids reading. Ella Mentry School is just plain weird! From a principal who kisses pigs to a teacher who wears dresses made of pot holders, A.J. and his friends have had some wacky adventures. Now fans can have all twenty-one books in the bestselling My Weird School series on hand! #5: Miss Small Is off the Wall! #6: Mr. Hynde Is Out of His Mind! #7: Mrs. Cooney Is Loony! #8: Ms. LaGrange Is Strange! #9: Miss Lazar Is Bizarre! #10: Mr. Docker Is off His Rocker! #11: Mrs. Kormel Is Not Normal! #12: Ms. Todd Is Odd! #13: Mrs. Patty Is Batty! #14: Miss Holly Is Too Jolly! #15: Mr. Macky Is Wacky! #16: Ms. Coco Is Loco! #17: Miss Suki Is Kooky! #18: Mrs. Yonkers Is Bonkers! #19: Dr. Carbles Is Losing His Marbles! #20: Mr. Louie Is Screwy! #21: Ms. Krup Cracks Me Up! Perfect for reluctant readers and all kids hungry for funny school stories, Dan Gutman’s hugely popular My Weird School chapter book series has something for everyone. Don’t miss the hilarious adventures of A.J. and the gang!